So you’ve got an idea for a new small business. That’s great. Just keep in mind that it won’t be easy. According to the Australian Bureau of Statistics (ABS), Australia had 2.1 million small businesses in June 2015. Out of those, 61% had no employees, 98% had fewer than 10 employees, and most had turnover an annual turnover of less than $200,000. One out of every three will fail in the first year. Two out of every four will fail by the end of the second year. Three out of every four will fail by the fifth year. But if you’re still keen on giving it a go, then this series of articles will help you beat the odds. Over the next few months we’ll be talking about registrations, business plans, accounting systems, cash flow management, HR and exit strategies. 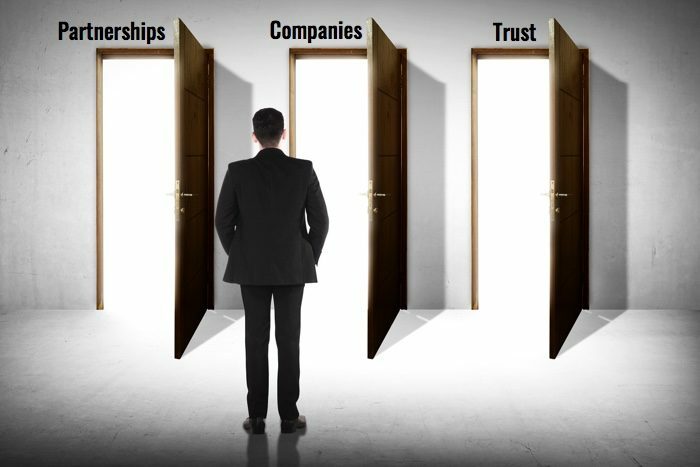 But today we’re talking about three small business structures (Partnerships, Companies and Trusts), and looking at the pros and cons of each type. For the record, the ABS report states Australia has 800,000 companies, 500,000 trusts and 300,000 partnerships. Here’s a brief overview of each one. Partnerships are a simple way for two or more people to go into business together. Partnerships can be with both family members and non-related parties. The biggest downside of forming partnerships with non-related parties is that each person is responsible for all the partnership’s debts (This is often referred to as “joint and several liability”). Partnerships can be governed by a partnership agreement. While we consider them imperative for all non-related partnerships, they can also be a good idea for partnerships formed by related parties. Despite everyone’s best intentions a partnership can break down, and the agreement sets out what will happen if it does. Income from a partnership is usually split equally at the end of the financial year, with each partner paying the tax on their respective shares. However, there’s nothing preventing a partnership agreement being made where profits are split unequally in any proportions. A company is an entity that’s legally separated from its owners (shareholders). Its popularity stems from the protection it gives the shareholders if the company fails. Generally, shareholders can’t be called on to inject funds to help pay the company’s debts. But this protection is often overruled by creditors (particularly the banks) insisting on Directors guarantees. Loaning money to shareholders and associates can be a problem for companies (it’s often considered a dividend), as can paying excessive salaries to associates. Companies may also find it hard to get the same capital gains tax concessions as small businesses. Trusts are difficult to explain. In technical terms, a trustee (which can be one of more individuals or a company) holds assets in name only for the benefit of a defined group of people known as beneficiaries. And the trust itself is governed by a signed document called a trust deed. Like the Company structure, using a Trust structure provides a degree of asset protection as personal assets usually aren’t available to pay the trust’s debts. And just like the Company structure, the banks will usually insist on guarantees from those controlling the trust to cover loans and overdrafts. At the end of each financial year, the trustee normally makes the decision to allocate the year’s income to the beneficiaries, who then declare the income and pay tax on it. If the trustee doesn’t make that decision, then the income is taxed at the highest personal tax rate. Contrary to popular opinion, trusts aren’t a way to avoid paying tax. However, they can be used to minimise tax by spreading the income among family members to take advantage of low tax rates. Note: Any losses remain in the trust, and cannot be accessed by beneficiaries for their own benefit. Trusts are also used to pass control from generation to generation without triggering capital gains tax or stamp duty. And with careful planning, trusts and beneficiaries can access the small business concessions for capital gains tax. As we said earlier, this is just a brief overview of each structure. Before you start, you should talk to your accountant about which type would be best for your business. You can change your business’ structure, but doing so may trigger capital gains tax and possibly stamp duty. So it’s much better to set up correctly in the first place. If you’d like more information about these business structures, or would like to know which type might best suit your small business, don’t hesitate to get in touch with us. Because we’d love to help you beat the odds.